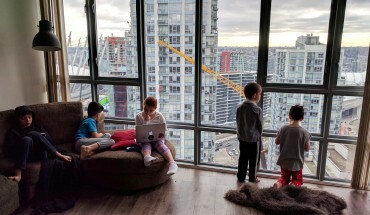 One of the more frequent requests I get from readers of my 5kids1condo.com blog is for video tours of the condo. The Georgia Straight did a video tour a couple years ago and bits of the condo appear in videos from time to time, but we’ve never done something truly comprehensive. Wide open living room, suitable for activities from painting to dance. Recently I met the two young men behind Van Chernen. 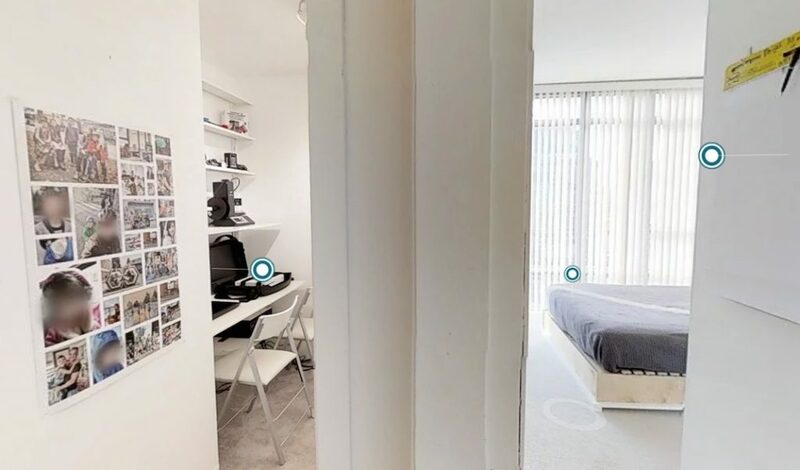 They do virtual reality (VR) tours of new real estate listings. 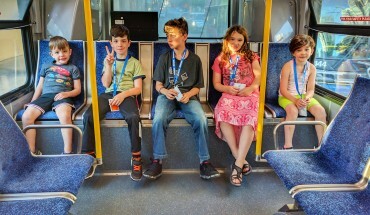 And although I rent my condo, we all thought it would be cool to use their technology to provide the most immersive tour yet of the condo and how we’ve maximized it to fit 5 kids (and me)! 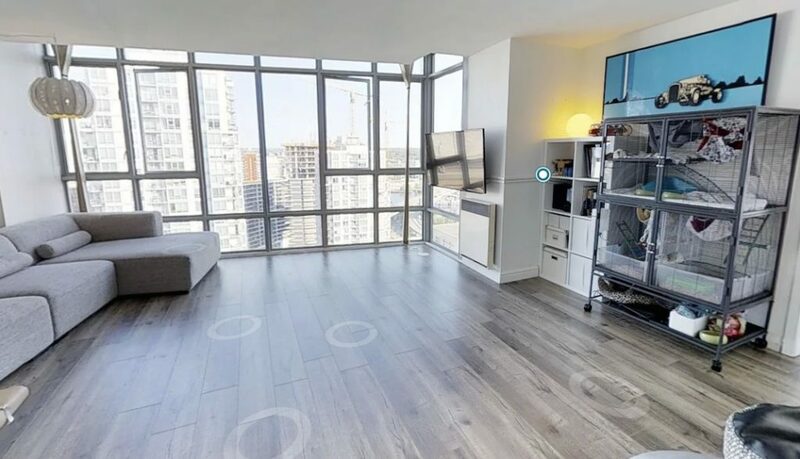 You can view the tour in your browser, or you can download the Matterport VR viewer and walk through the condo with your favourite pair of VR goggles. Maker Lab (converted in-suite storage unit) visible on left. I’ve made notes on some of the more unique things in our space, including the brand new Maker Lab (formerly our in-suite storage room turned art space). We painted, carpeted, and outfitted this 32 square foot room with a track shelving system (Algot from IKEA) in order to provide space for a couple kids at a time to use their computer or Xbox. It’s also home to our 3D printer. Front closet converted to reading nook with storage (on right). We also just converted the front closet into a seating nook (reclaiming a whopping 8 square feet!) with built in shoe storage. To do so, we re-oriented all the backpack and jacket access to be on hooks beside each of the kids’ beds in their bedrooms. This cuts down on conflicts in the morning as the kids used to collide with each other trying to access one small closet space. 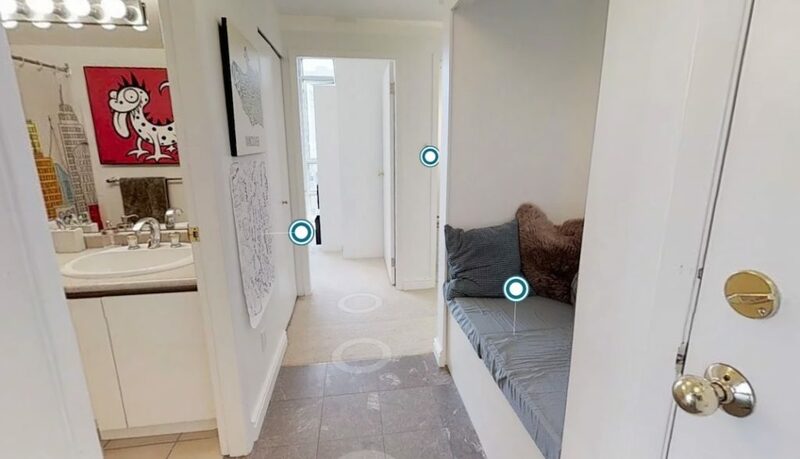 Also, in the girls’ room and in my room, look for a clickable, green “360” link that shows what each of the beds converts into. Check out the VR tour! Love it! Thank you for sharing this! It gives me great ideas of how to better organize our 2 bedroom condo to make it work for 2 adults and 2 kids. I just noticed it wasn’t working myself! Sent a note to tech person just now. Hopefully it will be back to soon. Hey Adrian! Just tried to view the tour, but it still says it’s not available.